Infections continue to play an important role in the management of transplant recipients and remain the primary cause of post-transplant, nonrelapse morta-lity. Several advances in the diagnosis and treatment of infections have taken place over the last few decades. 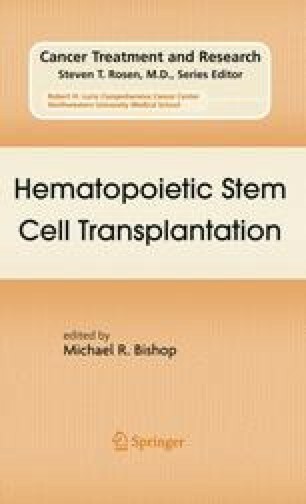 It is still too early to be certain how these new approaches will impact the outcome for patients undergoing hematopoietic stem cell transplantation (HSCT), but there is no question they have impacted clinical practice. Antibiotic prophylaxis during neutropenia, new antifungal and antiviral agents, serological tests for aspergillosis and other fungal infections, the development of molecular techniques for the diagnosis of viral and parasitic infections, and the continued emergence of new pathogens are topics that are relevant and will be reviewed in this chapter. Freifeld AG, Segal BH, Baden LR, et al. Prevention and treatment of cancer-related infections. Presented at 12th Annual NCCN Conference, Hollywood. 2007. http://www.nccn.org Accessed March 2007.